My mother’s birthday is at the end of August–sometimes falling right in the middle of Labour Day weekend (if you want further proof of this, see my earlier post on her Summertime Tea Party). What’s really interesting, or at least it was for me, is when you see your mother in action as not just “mom” but as “grandma”… particularly if this is to your children, and in my case since I was my mothers’ only child this was the only way that was going to happen. Putting on my gift-giving hat, this is a very cool challenge because I get to think about different kinds of gifts for her from my children and work with them on the selecting and assembling. Experience Gifts: My mom has the same theater bug I have, and this now has extended to my daughter. We are officially three generations of theater geeks–we also all sing loudly to any kind of music in any forum or format we recognize even in the most remote way, but I digress. So for special gifts, theater tickets allows us to share a magical experience together that we all will enjoy. When I’m looking to get a gift experience that feels a bit more indulgent, a manicure and pedicure is something the three of us can enjoy together and for something just for my mother and me that is a bit more dear, I book us a spa day and we get pampered for an afternoon. Jewelry Options: I love to get, shop for and look at jewelry. It can be vintage, flea market, luxury retailer, department store, niche or specialty shoppe, it really doesn’t matter as long as there are fun, quality, creative pieces to explore. However, buying jewelry for a mom or grandma can be tricky. This is a task usually saved for dad or grandpa. In the case of my mom, my father passed in 1997 so the jewelry option was wide open from then on. Over the years I’ve given her stud earrings in her birthstone (peridot) ($150, ice.com) and even one year a small diamond pendant ($450, ice.com) because I saw how much she liked the one my husband gave me. If this is your situation and you have the means, that’s lovely. Also, birthstones make nice and more economical alternatives than say, diamonds in earrings, pendants, rings and the like. If not, something like this My Mother My Friend ($69.95) necklace from RedEnvelope is a nice option. And for a grandmother, I was loving this beautiful locket ($139.95, Red Envelope, right) they had with engraving options on the front. Putting pictures of children and grandchildren inside goes without saying, of course. The Hobbyist: My grandmother hand-knit afghans, sweaters, scarves, even Christmas stockings for pretty much all of us so when I saw this knitting bag ($16, Uncommon Goods, right) I immediately thought of her. 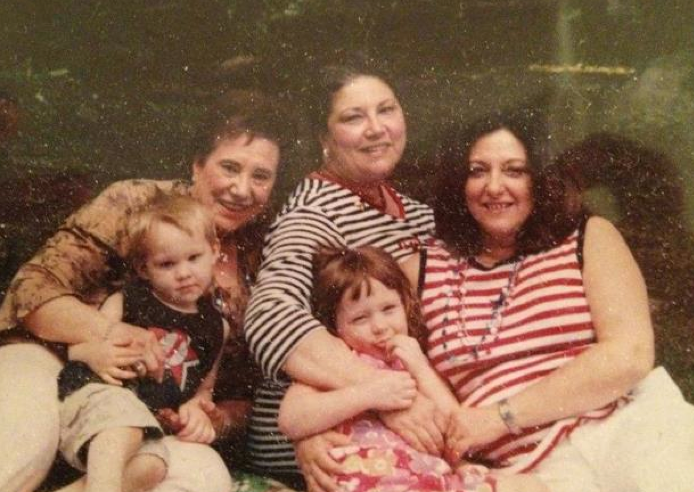 Every summer we celebrated her birthday with a July 4th lobster bake (she was born 7/3-see lead image for a snap of one such occasion) in her backyard where she had a flower and sometimes tomato garden so this gardening apron ($34, Uncommon Goods) would have made her smile like it did me. She was a cool lady and I miss her all the time. I’m so glad she got a chance to meet her great-grandchildren. The Alternative Archivist: I’m now obsessed with the idea of collaborative archiving and this Family Traditions Journal ($30, Uncommon Goods) is such a wonderful gift to start documenting special memories and moments — and it’s not corny or too precious. For grandma (and she can even share it with grandpa) this Grandparents Journal ($32, Uncommon Goods) is a nice way to help your mom create a memory book for your little one…just make sure your name isn’t on the card so she doesn’t think she’s getting criticized. And finally, I loved this mother/daughter Treasured Passages ($38, Treasuredpassages.com) book that is an ongoing letter writing project. Smile, Hold The Cheese: Photo gifts can border on corny or, at worst, be downright cheesy. You don’t want to give a cheesy gift. Shutterfly offers the ability to make unique keepsake boxes (starting at $29, right), photo charm bracelets (starting at $49)–I suggest a B&W photo–and even funky iPhone cases (starting at $35). A few years ago we went on a trip with my mother-in-law, both mom and grandma in our house, and later we decided to surprise her with a bound photo book gift of pictures from our travels. She loved it and I was so impressed with it I ordered one for us too. Unfortunately it was made on Kodak Gallery, which no longer exists, but the aforementioned Shutterfly now has all my Kodak Gallery albums and I can order everything there with ease.